Ruggedised Cat5e UTP Network Cable (100 Metre Reel) - Ruggedised Cat5e UTP network cable with Neutrik* etherCON connectors - Length 100 metres - Supplied on reel with heavy duty steel frame and integral carrying handle - 3-Year Warranty Program** - Designed and engineered in England The CAT5E-100M ruggedised CAT5E cable provides a bidirectional digital audio network data link and features Neutrik etherCON NE8MC-1 connector carriers with an integral O-ring gasket to achieve IP54 water protection for high reliability, especially desirable in concert touring and festival applications. When used with MIDAS PRO Series and KLARK TEKNIK products equipped with HyperMAC and copper snake interfaces, the CAT5E-100M cable can transmit up to 192 bidirectional channels of 24 bit digital audio at 96 kHz sample rate. CAT5E-100M also supports 24 bidirectional channels and 48 bidirectional channels at 96 kHz and 48 kHz sample rates respectively for AES50 connections. CAT5E-100M can also be used for standard Ethernet applications, and is suitable for both 100 Mbit/s and Gigabit networks. The CAT5E-100M cable uses highly durable upjacketed Belden 1305A unscreened cable with a nominal 7.6 mm diameter. The 1305A cable features 24 AWG bonded-pair stranded (7/32) copper conductors with polyolefi n insulation and both inner and outer PVC protective jackets. 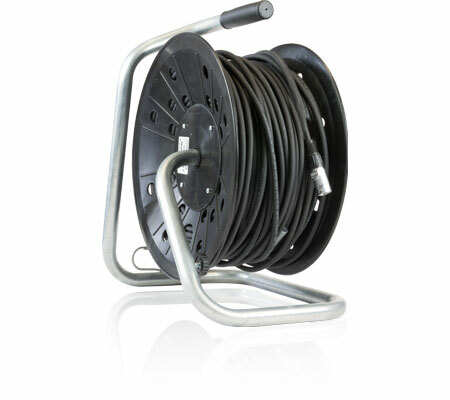 The CAT5E-100M cable is supplied on a reel with heavy duty steel frame and integral carrying handle for ease of transport, deployment and respooling. Architecture & Engineering Specifications The network cable shall be intended for use to provide digital audio multi-channel network data link and snake connections and be capable of bidirectional operation. The network cable shall provide transmission of up to 192 bidirectional channels of 24 bit digital audio at 96 kHz sample rate. The network cable shall also be suitable for standard Ethernet applications and meet the requirements for a Cat5e cable, and shall be suitable for use in both 100 Mbit/s and Gigabit networks. The network cable shall be 100 metres in length. The network cable shall use Belden 1305A cable. The network cable shall be fitted with Neutrik etherCON NE8MC-1 connector carriers. The network cable connector carriers shall be protected to the IP54 standard for water protection by an integral O-ring seal. The network cable shall be supplied on a reel with frame dimensions 330 mm diameter x 220 mm deep x 410 mm high (13.0" x 8.7" x 16.1") and nominal weight 8.0 kg (17.6 lbs). The network cable shall be the MIDAS CAT5E-100M and no other alternative shall be acceptable. You Are Covered We always strive to provide the best possible Customer Experience. Our products are made in our own MUSIC Group factory using state-of-the-art automation, enhanced production workflows and quality assurance labs with the most sophisticated test equipment available in the world. As a result, we have one of the lowest product failure rates in the industry, and we confidently back it up with a generous 3-Year Warranty program.